"I am a grenade," says Hall, and grenades aren't useful things to keep, long-term. "I have a specific use. 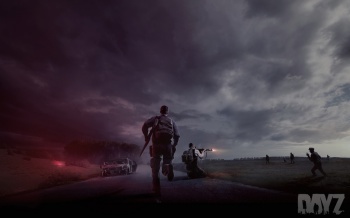 I'm really good at risk-taking and making other people take risks," says Bohemia's Dean Hall, the man who gave us DayZ. "I can talk people up to the ledge and get them to jump off it. That's what I did with DayZ ... But eventually, that's the bad person to have." So by the end of this year, Hall will leave Bohemia, shake the DayZ leadership role, and move on to new challenges. Besides, Hall argues, he never intended to stay this long. His Bohemia stint was supposed to be a brief break in his army career, not some kind of alternate lifestyle. He doesn't see himself as the sort of leader DayZ needs, long-term. That doesn't mean he's going to leave it half-done, but it does mean he's looking at the exit and wondering how much longer Bohemia will need him. The way he tells it, he was supposed to go much earlier than this, but decided it would be unfair to the DayZ community to bail. He admits that, even if Bohemia kept him on in a lesser role, he wouldn't be able to keep his hands off the zombies, so it's better if he goes. But in a sense it doesn't matter whether he goes or not; he'll still keep some ties to DayZ. There's no way he could completely sever all links to the community, or the game. So what happens next? Well it's back to New Zealand for Hall, and more game development, this time as the boss of his own studio. He wants to chase the perfect survival multiplayer experience. DayZ's great, but he knows it's flawed; he wants perfection. That won't happen right away, as he still has commitments to Bohemia. But it will happen, and sooner rather than later. It's time he was his own boss. "And, you know, I miss home."